While you may have been aware of Google’s experimental release of CalDAV support in July 2008 for testing purposes, the company has now announced official support for the protocol. CalDAV is an extension to the WebDAV protocol, enabling users to access schedule information on a remote server and use the iCalendar format for the data. Perhaps more important, as many users have already been utilizing the beta functionality to sync their calendars, is the release of Google’s new iCal setup program, Calaboration. 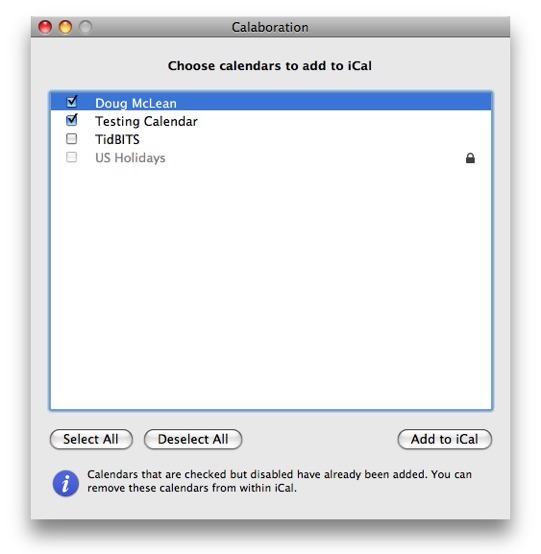 Calaboration automatically finds your Google Calendar account and assists in adding its calendars to iCal on your Mac. To download Calaboration, log into your Google account, go to Google Calendar, and at the top of the page next to your username you should see a “Sync with Apple iCal” link. Click the link to get instructions on how to set up Calaboration and import your Google Calendar information into iCal. I tested Calaboration to see how well it imports and syncs new calendars, and found it easy to use and efficient. It took only a few quick steps to sync a calendar from Google Calendar into iCal; the process was a breeze. This is a significant improvement over Google’s unofficial CalDAV support. A few months ago, Adam and I went through several failed attempts in trying to share a particular TidBITS calendar to my copy of iCal (iCal constantly threw an error when trying to subscribe to the calendar’s public URL; eventually we made it work by Adam sharing the calendar’s private URL with me.) The process was confounding and frustrating, but if Google’s new official CalDAV support proves reliable in the long run, such irritations may be a relic of the past. These developments also increase the competition for BusyMac’s BusySync, an iCal syncing utility that can bidirectionally sync events both between copies of iCal on different Macs and with Google Calendar. BusySync offers the same basic functionality as Google’s official CalDAV syncing, but also provides more advanced setup options and better integration with the iPhone. (With Google’s CalDAV syncing to iCal, synced calendars are read-only when synced to an iPhone via USB and iTunes, and don’t appear at all if you sync your calendars to the iPhone via MobileMe. BusySync eliminates both problems, enabling calendars from Google Calendar to be synced read/write to the iPhone via either MobileMe or iTunes.) If you’re looking to be able to sync your calendars to and from your iPhone or iPod touch, BusySync may be the better program for you.